Today’s blog post is my entry to this weeks Simon Says Stamp Monday Challenge which is called Emboss It. I really wanted to use my embossing powders and heat tool, but since my little craft nook is not yet set up with a power adapter I had to scrap that idea! So I decided to use one of my few embossing folders and see what I could come up with! (Few because of lack of funds, not interest. If I had money I’m fairly sure I’d buy every embossing folder in sight! I used a Spellbinders folder, I can’t remember the name off the top of my head. (I’ll update when I can check it!) and I had a really hard time getting it through my Big Shot! I tried with all tabs open and it was still a no go. In the end I ran it through on a cutting plate, all tabs down but no cutting plate on top. It worked beautifully but I’m not sure if that’s ok to do? I did not have this trouble with my other embossing folders. Anywho! 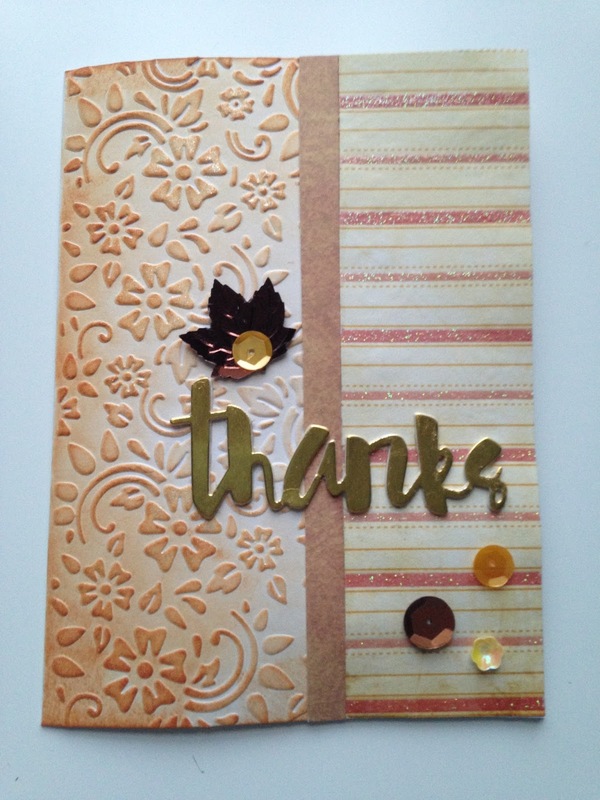 I wanted my card to feel warm so I inked up the embossed image with Distress Ink in Rusty Hinge. I then cut some strips of pattern paper (with sparkles!) and adhered them on one side. I used the Simon Says Stamp painted thanks die (free with an order from Simon!) 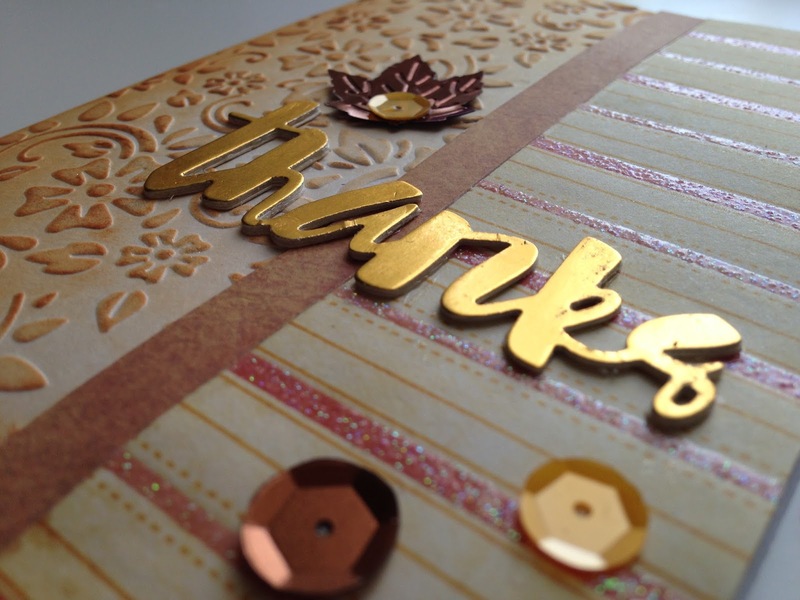 with gold cardstock and I also diecut it a few times on plain cardstock and glued them together with Tombo Mono Multi Glue, to give it just a little dimension. I added some sequins and some clear Wink of Stella to some of the raised flowers and the front was done! 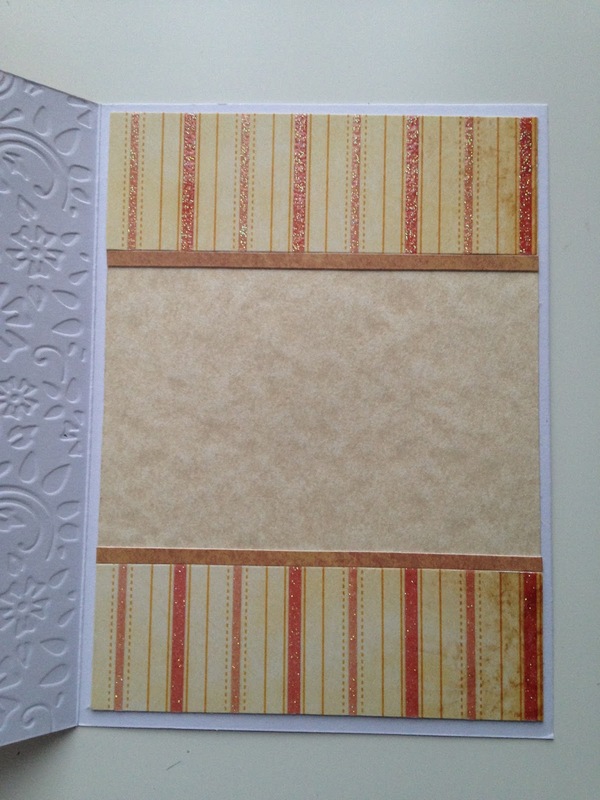 I used some of the same pattern paper leftovers for the inside of the card. Quick Tip! : I wanted the brownish strips to be pretty thin and I didn’t want to used liquid glue so before cutting them down to size I used double sided tape on the back of the paper. Once the strips were cut I could peel the backing off the tape and stick into place! Handy! Ok, I have rambled enough! Time for photos! Previous Post A New Craft Space!